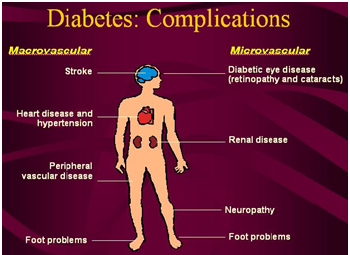 Diabetes is a disease in which your blood glucose, or sugar, levels are too high. Glucose comes from the foods you eat. 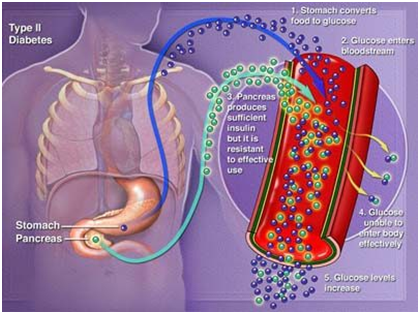 Insulin is a hormone that helps the glucose gets into your cells to give them energy. With type 1 diabetes, your body does not make insulin. With Type 1 Diabetes (Insulin dependent diabetes mellitus), your body does not make insulin. With Type 2 Diabetes (Non-Insulin dependent diabetes mellitus), your body does not make or use insulin well. Without enough insulin, the glucose stays in your blood. Type 2 diabetes is the most common form of diabetes. The International Diabetes Federation estimates that the number of diabetic patients in India more than doubled from 19 million in 1995 to 40.9 million in 2007. It is projected to increase to 69.9 million by 2025 (Link). -	You could have eye problems, including trouble seeing (especially at night), and light sensitivity. You could become blind. -	Your feet and skin can develop sores and infections. After a long time, your foot or leg may need to be removed. Infection can also cause pain and itching in other parts of the body. -	Diabetes may make it harder to control your blood pressure and cholesterol. This can lead to a heart attack and other problems. It can become harder for blood to flow to your legs and feet. -	Nerves in your body can get damaged, causing pain, tingling, and a loss of feeling. -	Because of nerve damage, you could have problems digesting the food you eat. You could feel weakness or have trouble going to the bathroom. Nerve damage can make it harder for men to have an erection. -	High blood sugar and other problems can lead to kidney damage. Your kidneys may not work as well, and they may even stop working. Often, people with type 2 diabetes have no symptoms at first. They may not have symptoms for many years. -	Check your blood sugar level as advised by your doctor. Your doctor will help you set your blood sugar goals. Most people with type 2 diabetes only need to check their blood sugar once or twice a day. 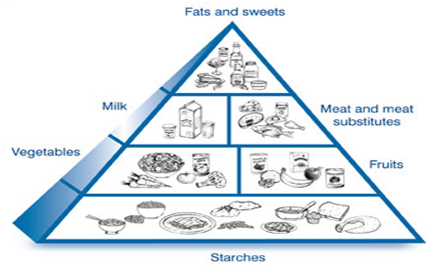 -	Maintain a well-balanced healthy diet. -	Keep your body weight under control. -	Exercise regularly after consultation with your doctor. -	Take medicines regularly as prescribed. -	Pay special attention at your foot. -	Do not neglect if you have any of the symptoms of diabetes mellitus or there are some family history of diabetes. -	Avoid taking junk foods, foods rich in carbohydrates and drinks containing sugar. -	Do not stop taking medicines unless your doctor advises so. -	Do not neglect if you notice any infection or numbness of your feet. To prevent problems from diabetes, visit your health care provider or diabetes educator at least four times a year. Talk about any problems you are having. Your doctor may prescribe medications or other treatments to reduce your chances of developing eye disease, kidney disease, and other conditions that are more common in people with diabetes. To prevent injury to your feet, check and care for your feet every day. You can help prevent type 2 diabetes by keeping a healthy body weight and an active lifestyle. Once detected diabetes, you should test your fasting blood sugar and post-prandial blood sugar level every month, Micro-albumin test every 3 months and eye check up every 6 months. It is never too late to adapt a healthy lifestyle and attain an ideal weight. Have a daily exercise regime in place along with a balanced diet. Eat foods that are low in saturated fats and cholesterol. Avoid foods high sodium content. If overweight or obese, loose the extra kilos and maintain a healthy weight. Quit smoking and cut down on alcohol. Check your blood glucose and blood pressure regularly.